If you’re ambitious you can go far in the nuclear industry, so long as you’re committed and hard working too. There are so many opportunities available, both in the UK and further afield, as people with engineering skills are needed in their thousands. The UK’s new build programme alone requires a workforce of more than 130,000. 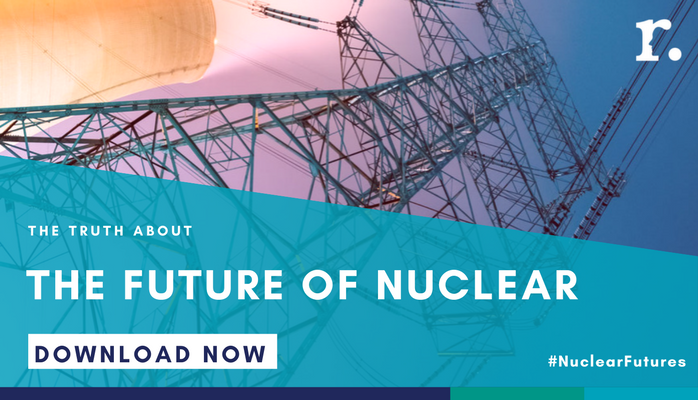 Have a look at our 'The truth about the Future of Nuclear' report to know more about the future of these sectors. Experienced nuclear engineers will be called upon to manage the large projects that are in the pipeline; so, if you’ve got drive and determination, now’s the time to act. As with any role, in any industry, increasing your chances of promotion within your current organisation will rely upon great performance, day in, day out. Showcasing your skills and a can-do, positive attitude is a must. In performance meetings, be honest about your ambitions so that when opportunities arise, you’re the first person your manager brings to mind. Share goals you’d like to achieve and take advantage of any in-house mentoring programmes and groups that are offered. Keep written records of successful projects you’ve worked on and make a note when you’ve gone above and beyond your normal duties. “Knowledge is power”, so learn as much as you can! Take an interest in nuclear, not just in work, but in your own time too. Take the time to read related articles and blogs, and take courses that will boost your skills and learning – not just those related to nuclear. Work to further improve skills in technology, leadership and even social media for boosting your personal brand – anything that is going to complement your role and ambitions. There are many on-line training options available for free or at low cost, meaning you can complete them remotely, in your own time and without breaking the bank. If your current company isn’t supporting your ambitions or you’re thinking, a change of scene might be beneficial for your career. If there simply aren’t any opportunities for progression with your current employer, keep your eyes open to other opportunities that may be out there. If you do make a move to another employer, never burn any bridges. It may be that although the company isn’t right for you currently, there could be opportunities for you to return in the future...hopefully further up the career ladder. Gain Registered, Incorporated (IEng) or Chartered (CEng) Engineer status to boost your employability options. If you become a chartered engineer and earn the title CEng, you prove yourself as a professional in your field and may open the door to many more career opportunities. Letters after your name can demonstrate your commitment to building a name for yourself in the industry. To gain the qualification, you’ll need to meet the industry benchmark and have hands on experience. You’ll be part of a technological elite, have access to life-long learning and it should increase your earning potential substantially. You may also want to get a master’s degree in a relevant field. One of the most popular masters of the moment is MSc Nuclear Science and Technology as it is geared towards plant decommissioning and nuclear waste management. If you join prestigious nuclear engineering committees and boards you’ll be able to attend events to not only increase your knowledge but allow you to network and build relationships with other engineers and companies of interest to you. Two of the best-known are the Nuclear Institute (NI) and Nuclear Industry Association (NIA). If you decide to join the Nuclear Institute, for example, you’ll gain access to NI Branch support, receive discounted rates for NI conferences, dinners and events, and complementary copies of the journal Nuclear Future. If you’re a woman, you’ll also be invited to join the Women in Nuclear UK group. Through these groups, you may be able to approach those you admire and ask if they’d be willing to take you under their wing. Every successful engineer needs mentors they can learn from. As part of our "Unlocking the future of nuclear" campaign, we recently carried out a survey amongst engineers in both nuclear and other sectors, in order to prompt further discussion around the reported skills gap. Want to know more about what our survey revealed? Download the full report by clicking on the banner below! Looking for your next nuclear role? Browse our Hinkley Point C roles to find your next nuclear opportunity!